We’re back to work and sketchin’ away. 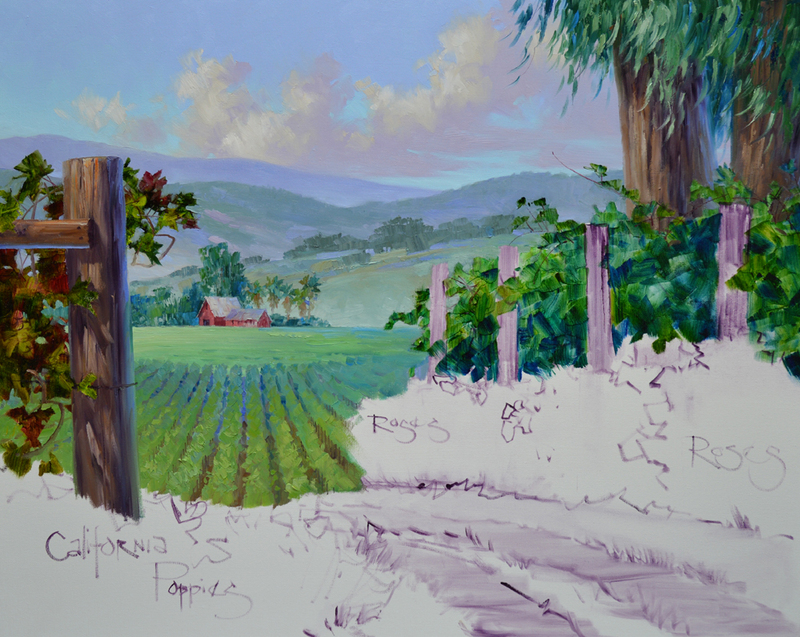 Getting the gate and building in helps in establishing size relationships for the elements in the foreground. The lanterns on either side of the gate were a challenge. 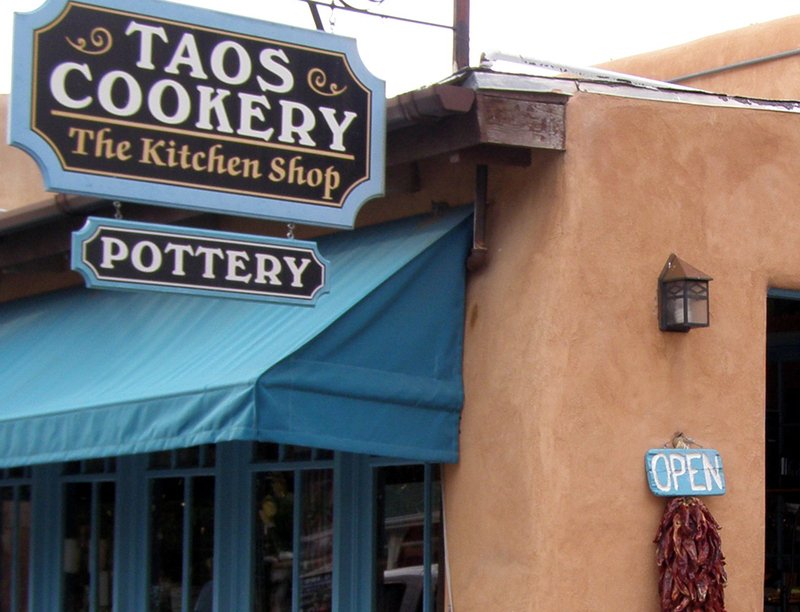 I’m using a picture we took in Taos for my model. The first one was easy, the tough part was getting the second one to match! The one on the left needs a little adjustment, I’ll do that when I paint them. Moving to the front porch the portal posts, corbels, door and nicho are drawn. 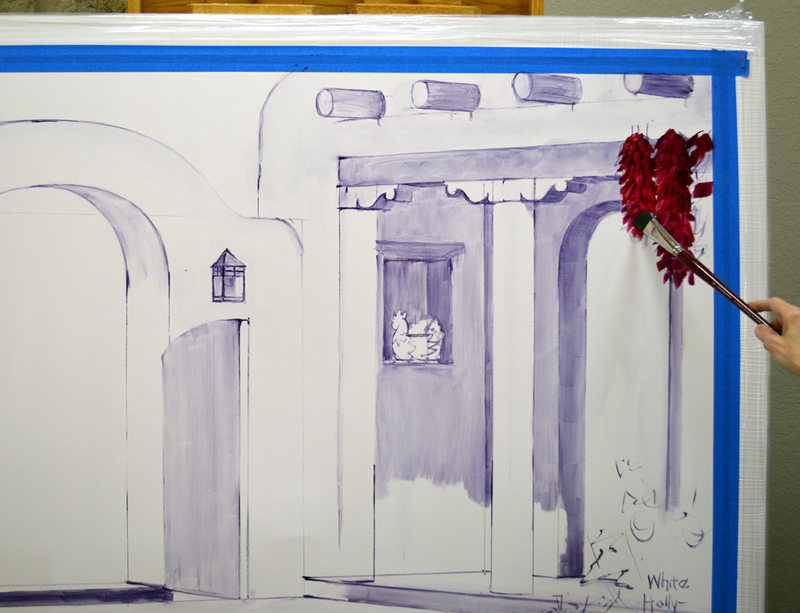 Using a large Bright brush I wash in the ristras with a mixture of Alizarin Crimson + Liquin. Fountains are a fun addition to a courtyard. The music of the water splashing is so relaxing. Sarah and Jim wanted a water feature with St. Francis. When I need to research for reference material I’ve found Google images invaluable. At a touch of the keypad I can travel the world. 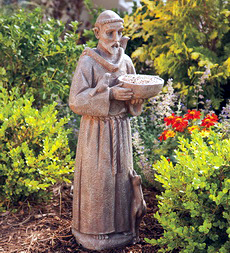 So I went on Google and found a neat St. Francis bird feeder. I like the bowl, it will be perfect to convert to a fountain. The water can cascade from it into a large round base below. 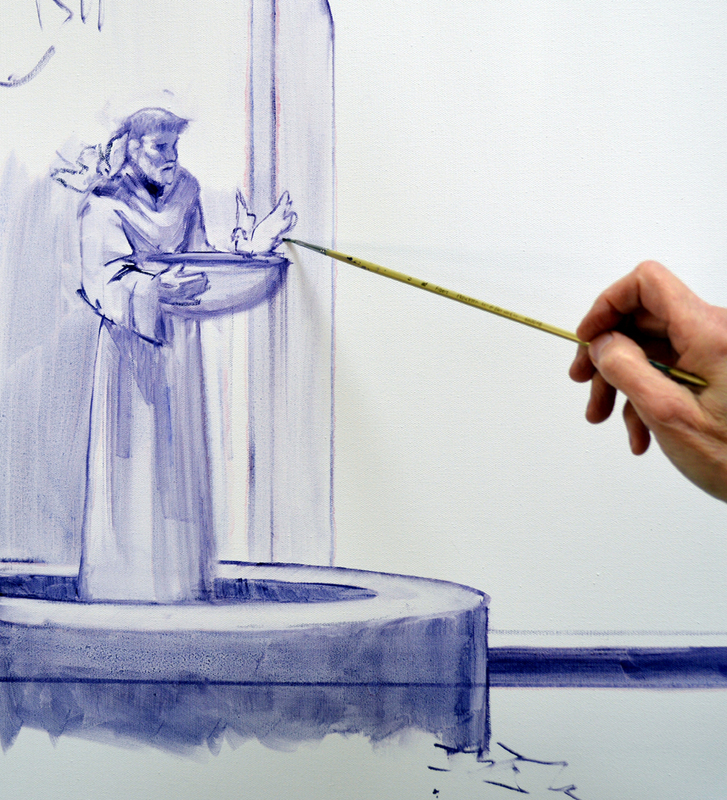 I design the statue for the fountain, drawing it up with a thin oil wash. After completing St. Francis I decided to add a couple of birds to the sculpture. 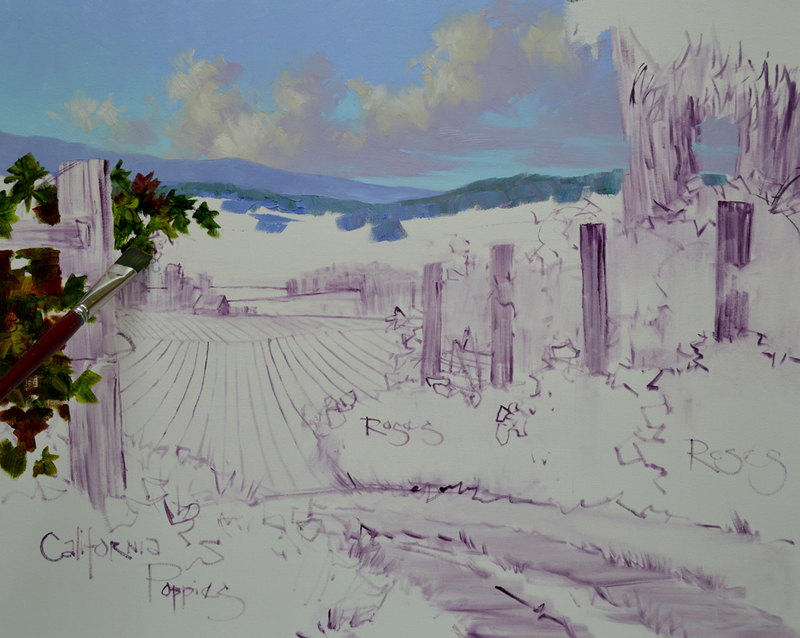 I let the bowl of the fountain extend over the gate behind it, this helps to give the painting depth. I’m beginning a new commission today. Sarah and James asked for a southwestern courtyard piece to hang in the master bedroom of their Las Cruces home. The painting will be at right angles to a large window overlooking the Organ Mountains, a distinctive landmark in this beautiful area. So their special piece will include the saw tooth shaped mountains in the background. They loved the sketch but asked for a couple of changes. They would like lights on either side of the gate and a Saint Francis sculpture as part of the fountain. No Problem. 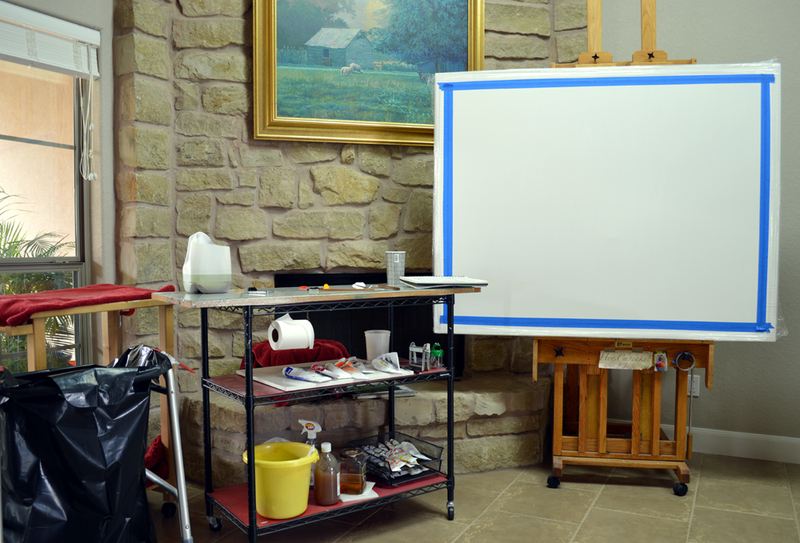 All of our studio furniture is on wheels, making it easy to accommodate any size canvas, large or small. To see my setup better you can enlarge the picture, just click on the image. That’s one of my favorite paintings of Jack’s above the fireplace! 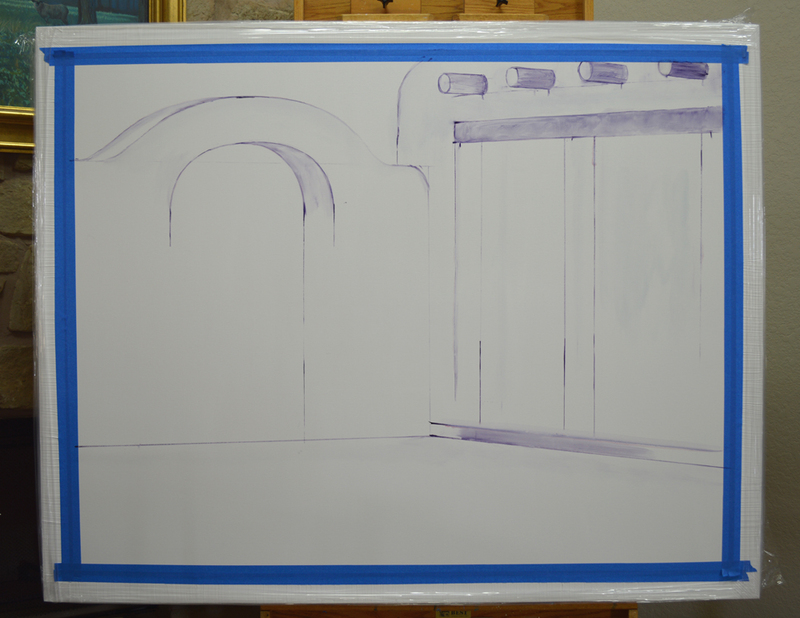 I like to be able to stand close to a large canvas when I’m sketching it up so the palette is wheeled to the side. The glass palette where I mix my paint rests on a culinary cart with two shelves. All of my supplies are organized and handy. 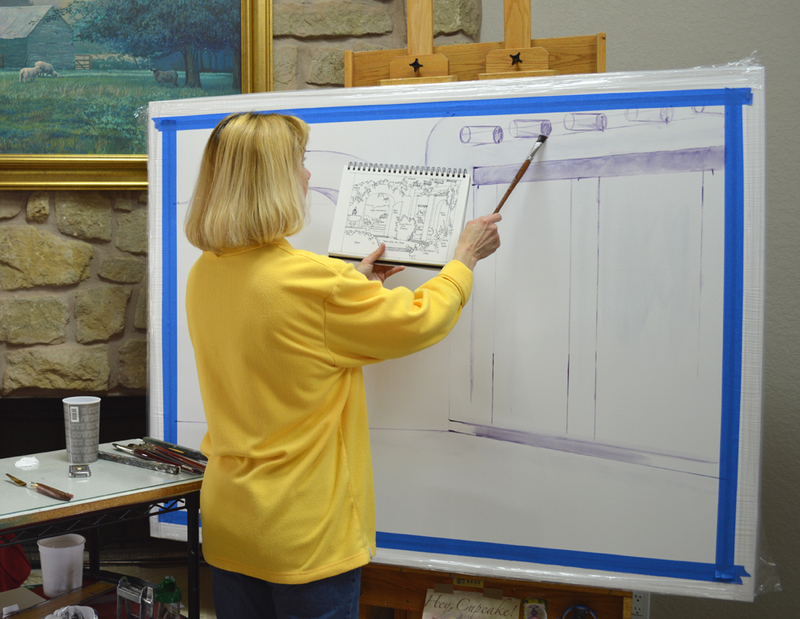 The easel is a Santa Fe type that cranks up and down. 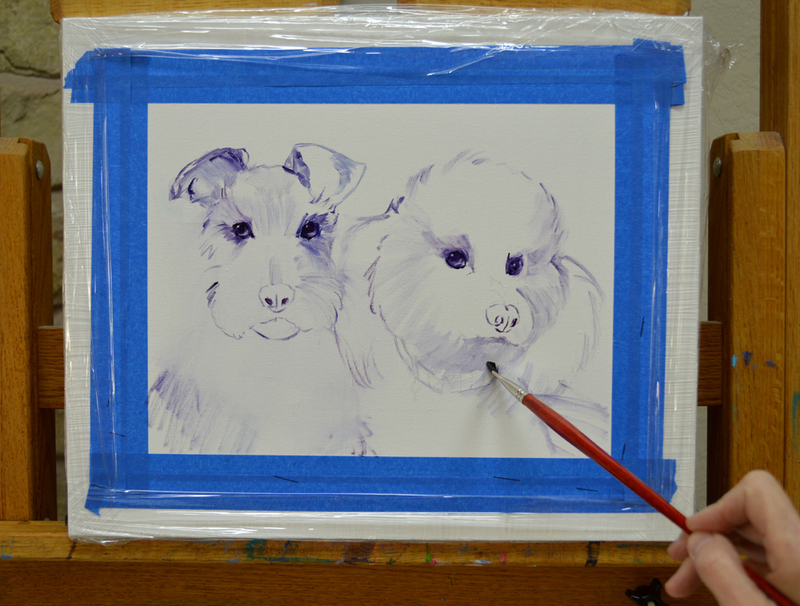 I can lower the canvas to work on the top and raise it for painting on the lower portion. The main advantage of doing this is to never paint above shoulder height. Painting with your hand above your shoulder puts too much strain on the rotator cuff muscles and can eventually cause damage. OPPS! This is a no – no. My hand is slightly above my shoulder as I draw in the vigas protruding from the building. I didn’t get the canvas lowered quite enough to work at the top. I’m drawing with a brush dipped in a thin oil wash of MUD (Ultramarine Blue + Alizarine Crimson) + Liquin. Fortunately it doesn’t take very long to draw the vigas, I’ll work on a lower portion of the canvas next. The blue painter’s tapes covers our White Senkarik Signature Frame and masks off the image area. 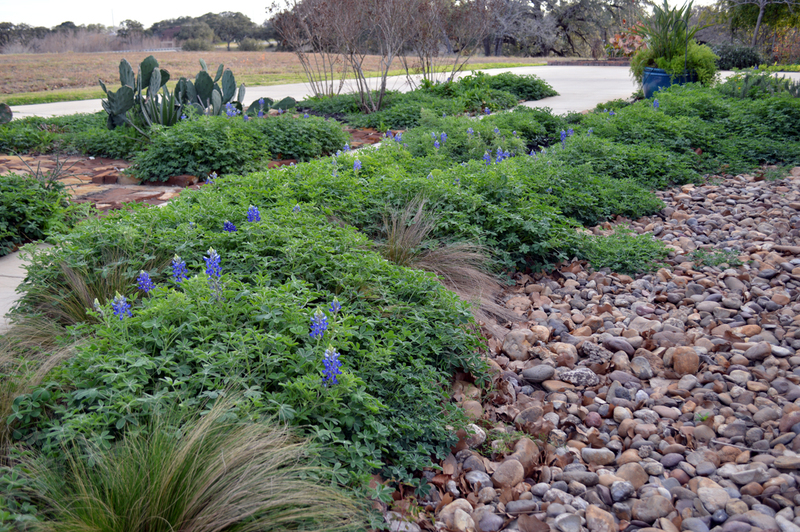 Our Bluebonnets are beginning to bloom profusely and it’s time to prune our arbor. 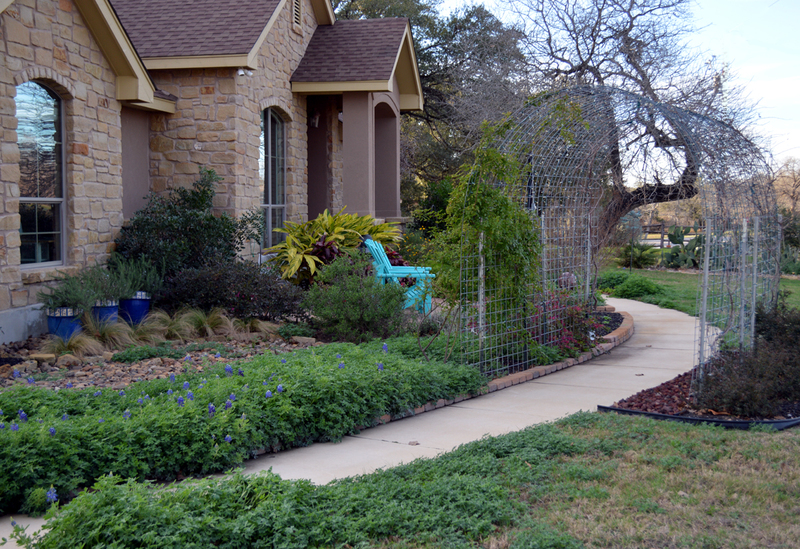 The structure is made of two sections of metal fencing that are arched over and anchored to steel posts. On the left side, closest to us, are Peggy Martin Roses. They got a haircut and will reward us with soft pink blooms in about a month. 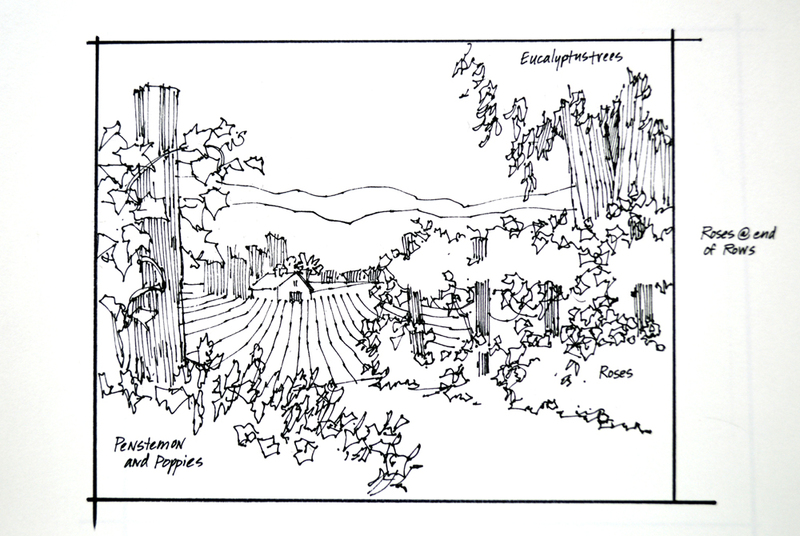 The rest of the arbor is covered with grape vines. As I was trimming them our neighbor, Carolyn, stopped by and suggested I make a wreath with the cuttings. Great Idea! Made the task fun: pruning, wrapping and weaving. 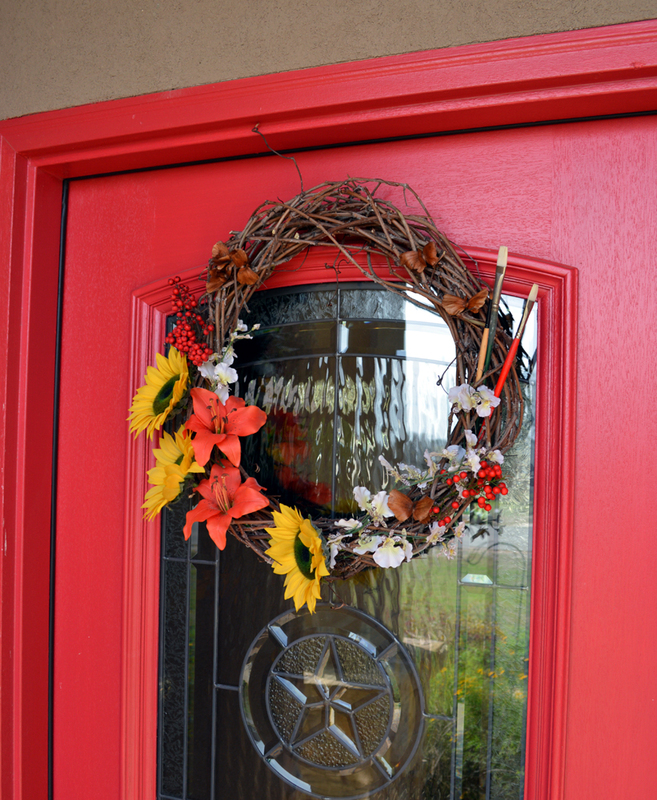 We added some silk flowers along with berries from our Nandina bushes. 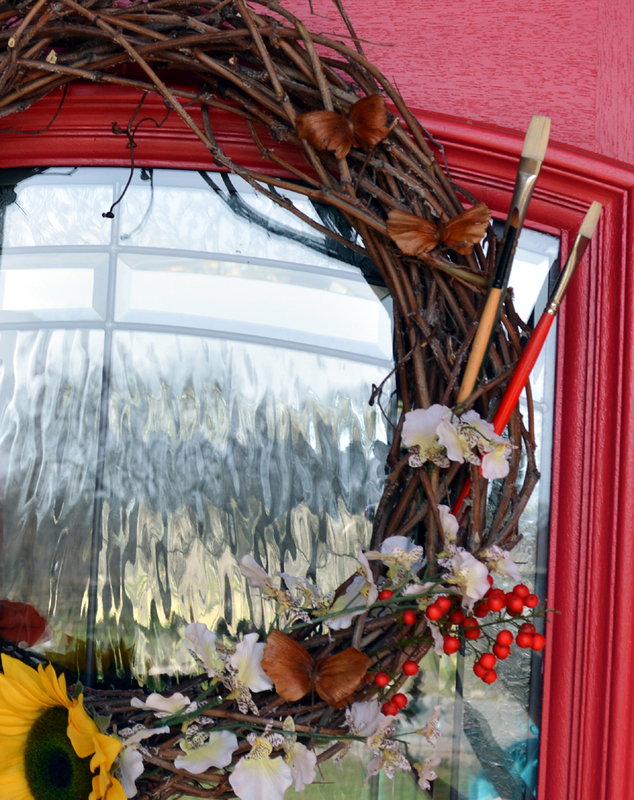 And a wreath for an artist’s studio just would not be complete without a few paint brushes! Our Mexican Butterfly Vine in the raised flower bed provided a nice touch. 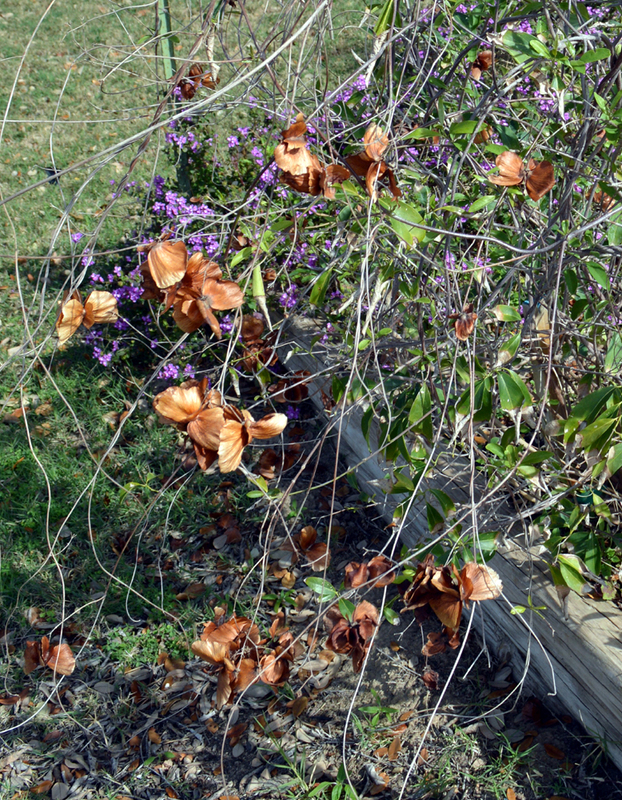 The dried seed pods look like Butterflies! 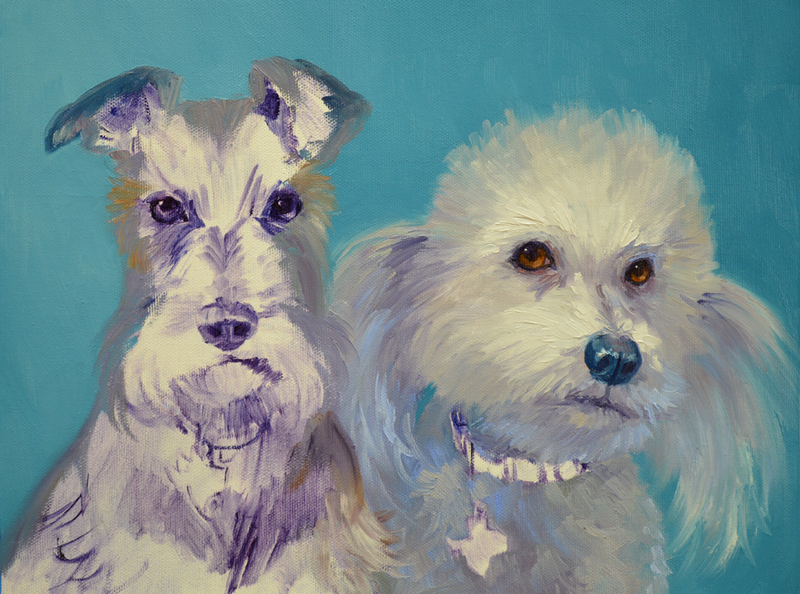 First of all, Jack’s latest article has been published at Fine Art Studio Online. To read The Four Most Harmful Addictions CLICK HERE. 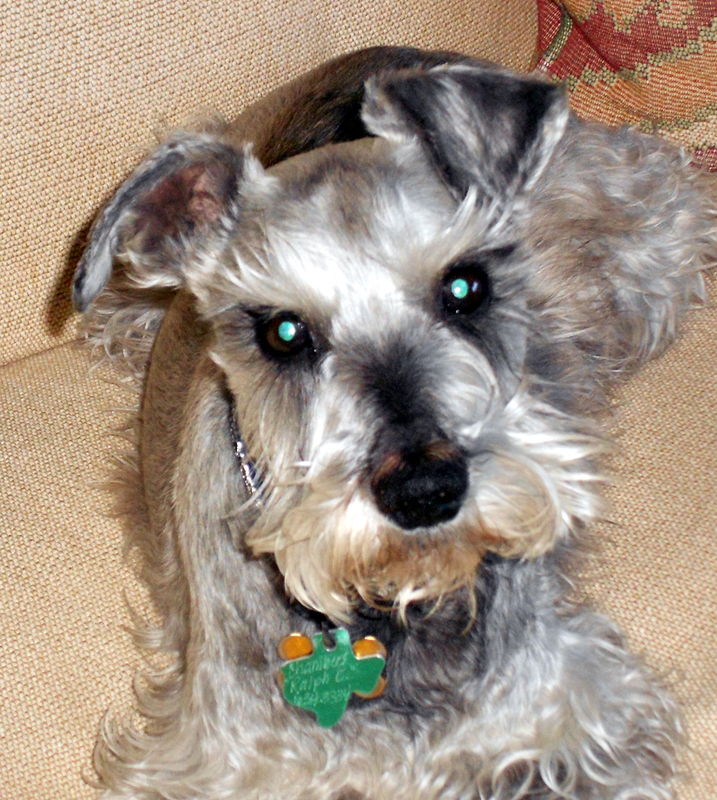 Ralph E, the Miniature Schnauzer, is next. 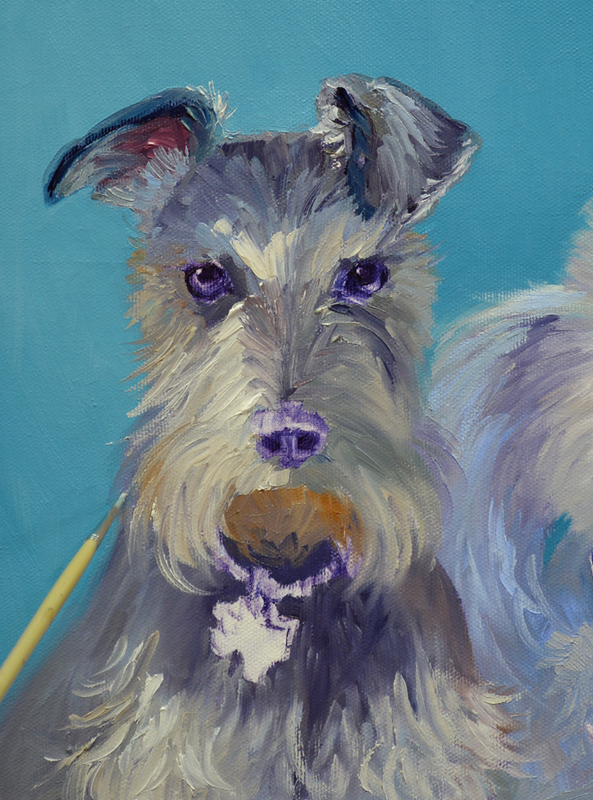 His coat color is mixed with Ultramarine Blue + Cadmium Orange in varying proportions. 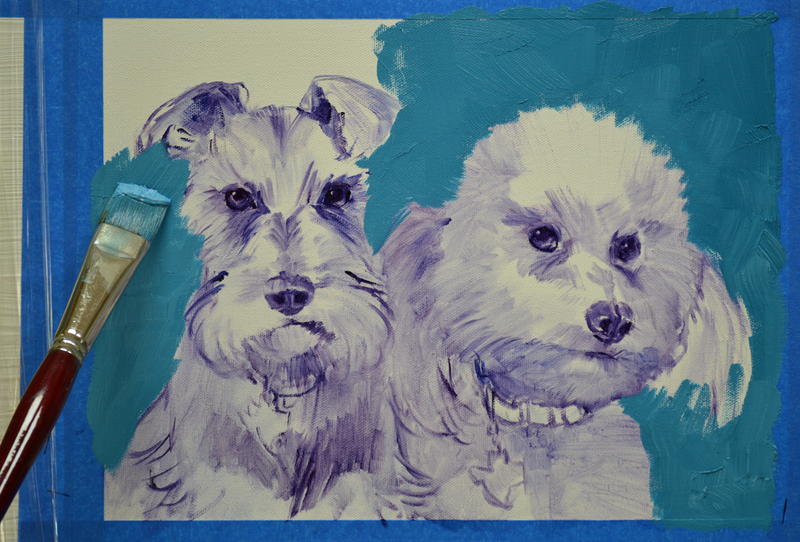 MUD (Ultramarine Blue + Alizarin Crimson) is added for the darker shades while White is mixed in for the lighter ones. The edge of the left side of his body is made soft so it will drop back. The edge of his shoulder on the right is sharper, I want it to come forward of Bright Eyes. This is a simple rule to remember: Hard edges come Forward, Soft edges go Back. His face is blocked in and I begin to add the feathery hair that makes up his moustache. To view any of these pictures larger you can just Click on the image. He comes to life when I finish his eyes. I follow the same steps that were used on Bright Eyes. If you would like to see them just CLICK HERE. 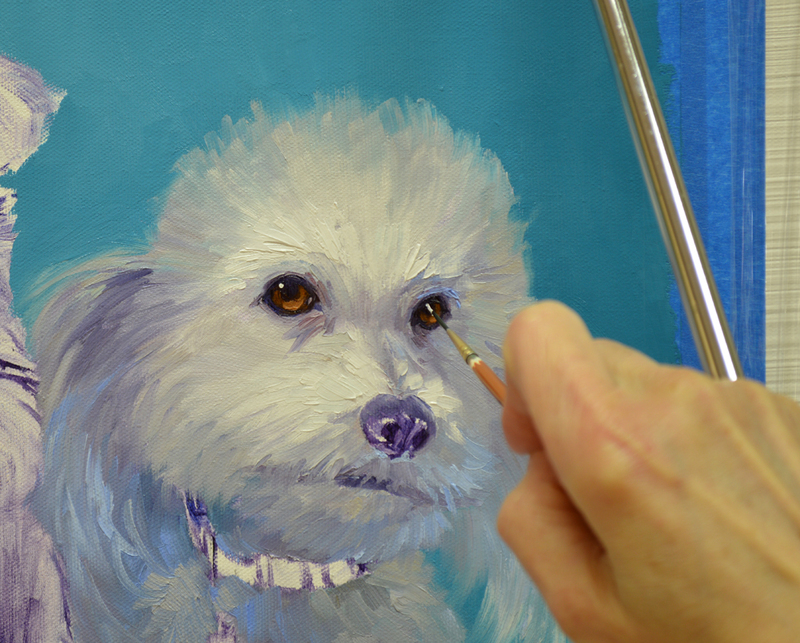 Then his nose is painted with mixtures of Alizarin Crimson + Pthalo Blue + White. Yesterday was a crazy day, I did get to paint but was unable to put a post up on the blog. It was vaccination day for Sissie and Molly, our shelter kitties. 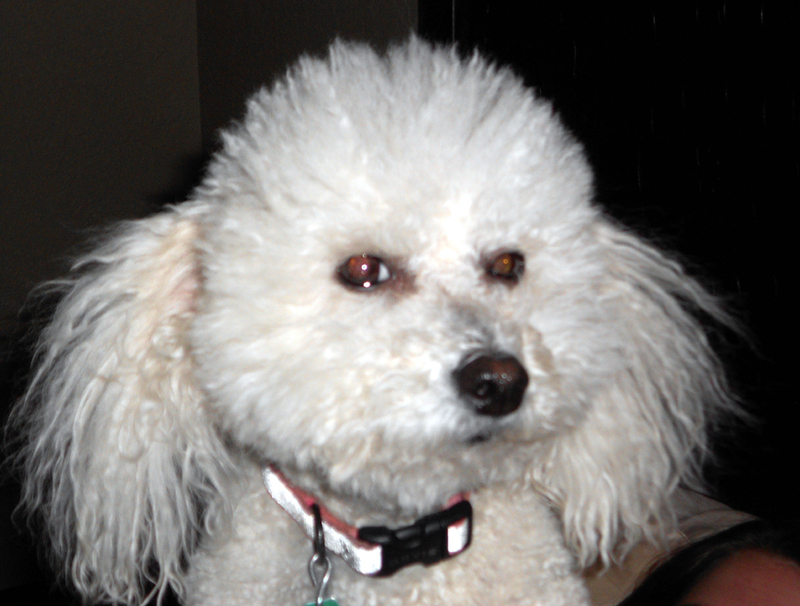 So a trip to Dr. George, our vet, was on the schedule in the morning. Molly loves her carrier but hates to ride in the car so she howled the whole way. I’m glad no one could hear her, they would have thought Jack and I were torturing her! We laughed the entire time driving to and from Dr. George’s. To make a long story short in mid afternoon little Sissie got sick. Now I must tell you she is not a “Lap Cat.” But all of a sudden my lap was the only place she wanted to be. And of course she wanted to be gently rubbed the entire time. Made working on the computer impossible. The good news is she is back to normal today. So anyway, let’s get to showing you what painting I did get done. The background color is mixed of various proportions of Cadmium Orange + Pthalo Blue + a little touch of MUD + White. 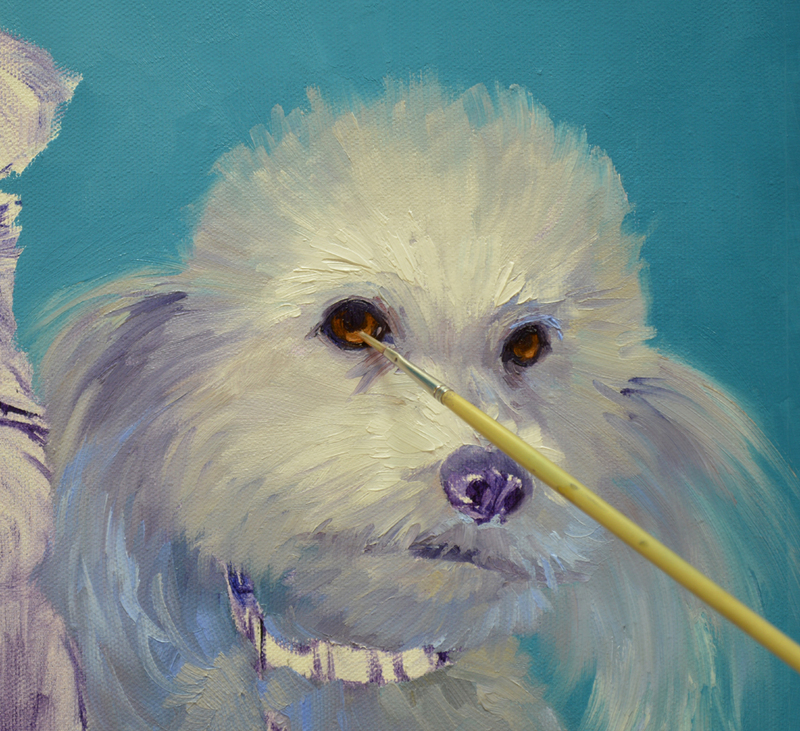 I begin blocking in the shadows and edges of Bright Eyes, the Bichon Frise. Working wet into wet allows me to get the feeling of her soft, fluffy fur. After her body is painted and face blocked in, I concentrate on her big eyes. 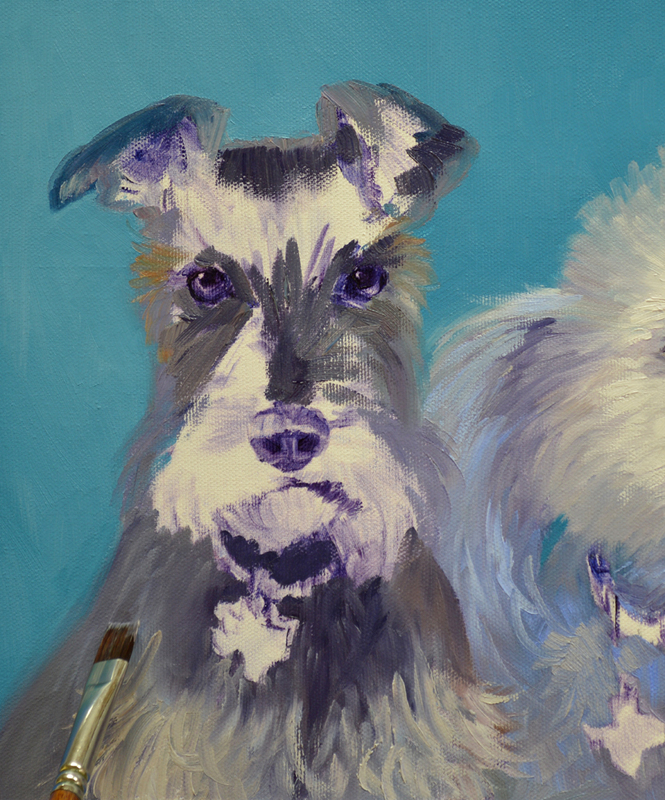 The entire area of the eye is covered with MUD (Ultramarine Blue + Alizarin Crimson). Then a crescent is made of a rich brown to indicate the iris. The center of the brown crescent is made a little lighter. This is the area directly across from where the catch light will be. You can enlarge the picture by clicking on the image. Bracing against the mahl stick to steady my hand, the tiny catch lights are placed high in the eye at the edge of the pupil. Since the light is coming from the upper left, they are placed at about 11 o’clock. The light from above hits the cornea then is transmitted through the eye to illuminate the iris on the opposite side. When painting portraits you have to be careful with the placement of the catch lights. Don’t place them in the center of the pupils, your subject will look as if they are drugged. 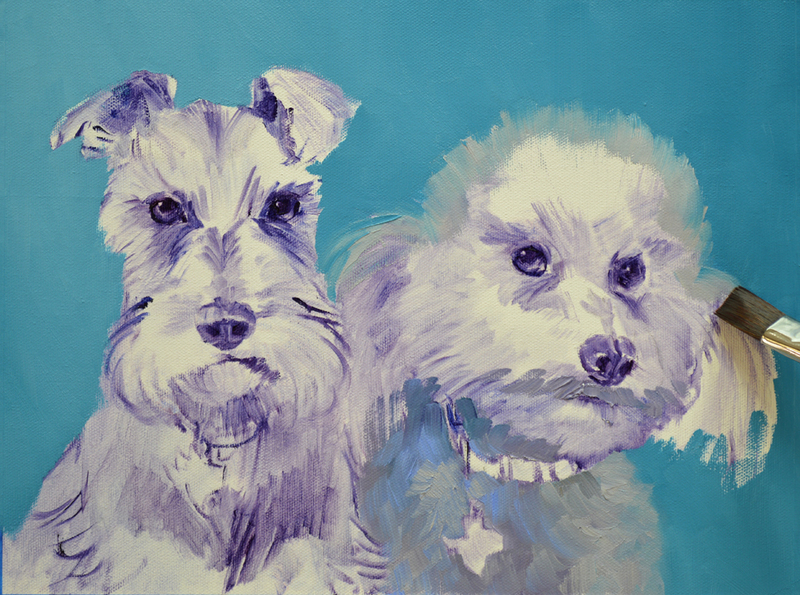 Puppies are so fun to paint, no matter what age they are! 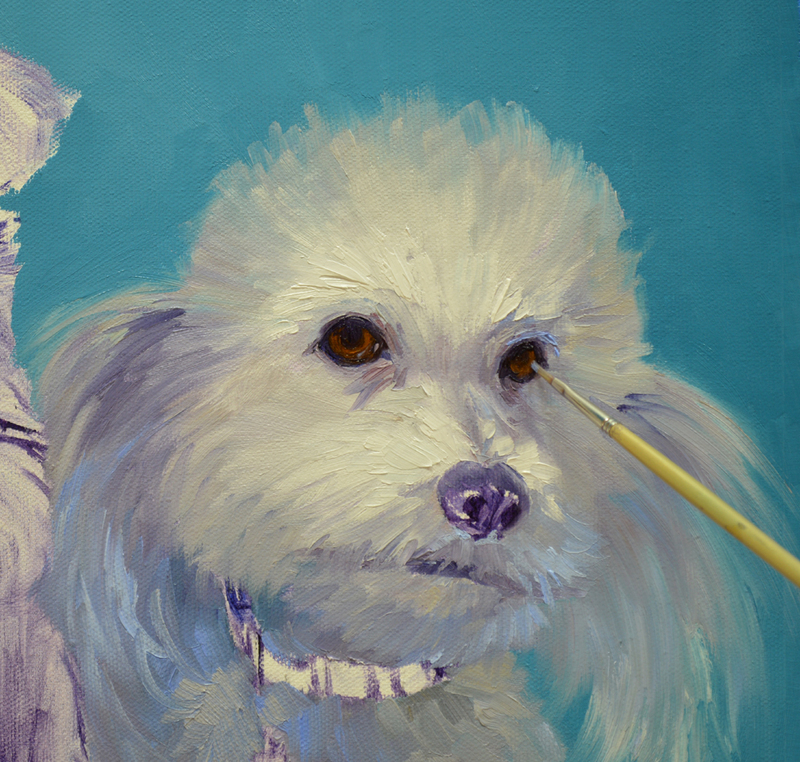 Today I’m starting a portrait of Ralph E, a Miniature Schnauzer, and Bright Eyes, a Bichon Frise. Penni, whom they own, asked me to put them together in one piece. So let’s get started. 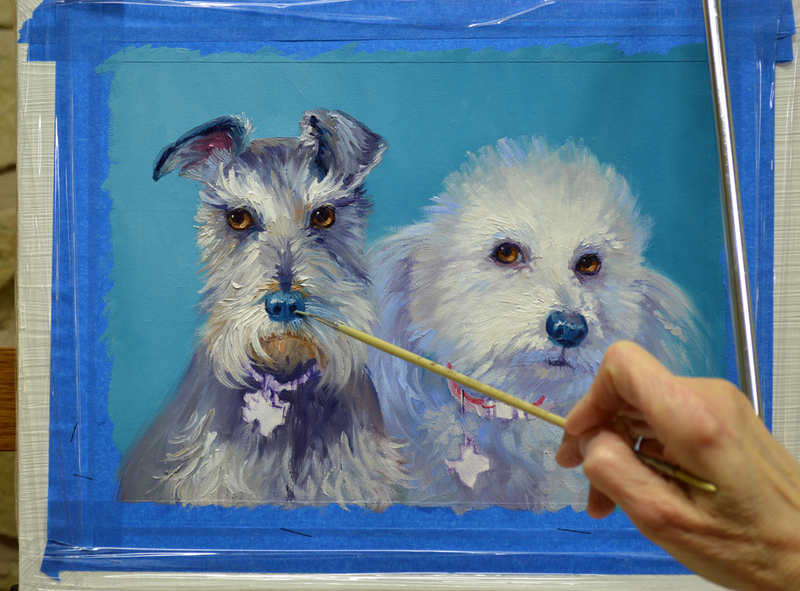 After lightly penciling in their features on the canvas I begin blocking them in with a brush dipped in a thin oil wash of MUD (Ultramarine Blue + Alizarin Crimson) + Liquin. If you would like to enlarge the picture just click on the image. The basic wash in is finished. At this point my main objective is to establish the light and dark patterns on the pair. As I begin painting I’ll concentrate more on the details. 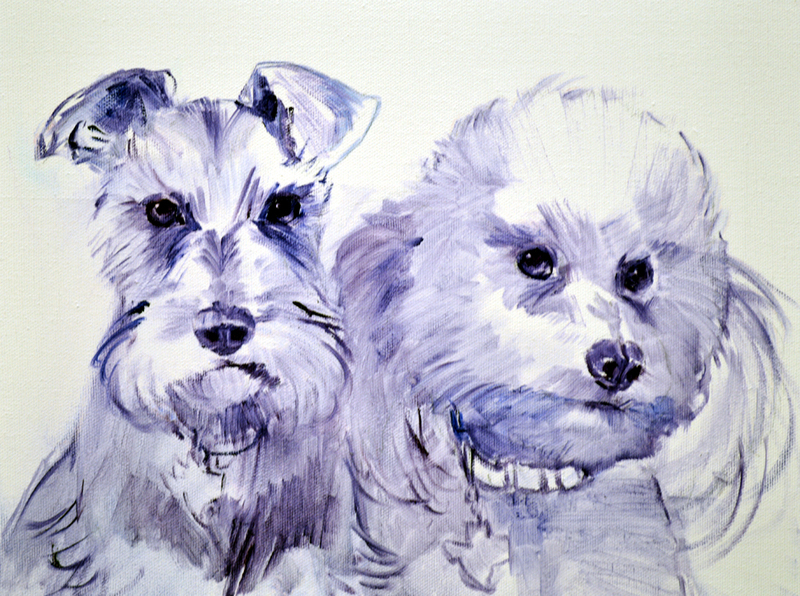 Beverly and Hal Bartholomew are wonderful friends and collectors of both Jack’s and my paintings. 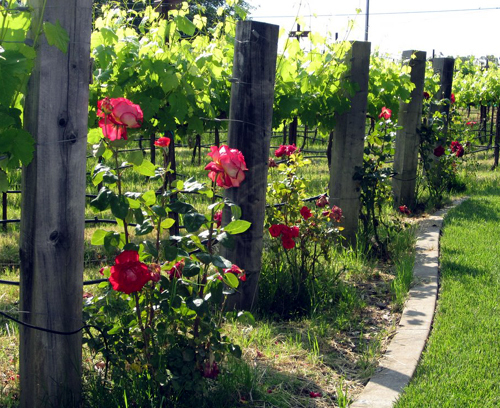 They also have a vineyard lined with the most beautiful roses. 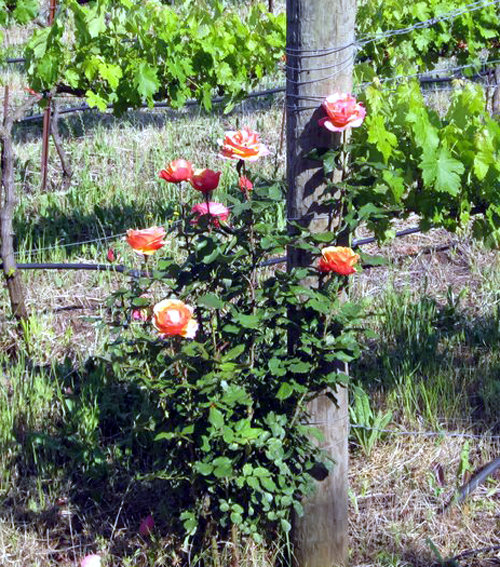 These fragrant guardians of the vines sparked the idea for this piece. I start the roses by blocking in the blossoms with mixes of Permanant Rose + White and Alizarin Crimson + Cadmium Red Light + White. Then the leaves are painted around the flower color. Following this sequence allows the pinks to remain crisp and clean. 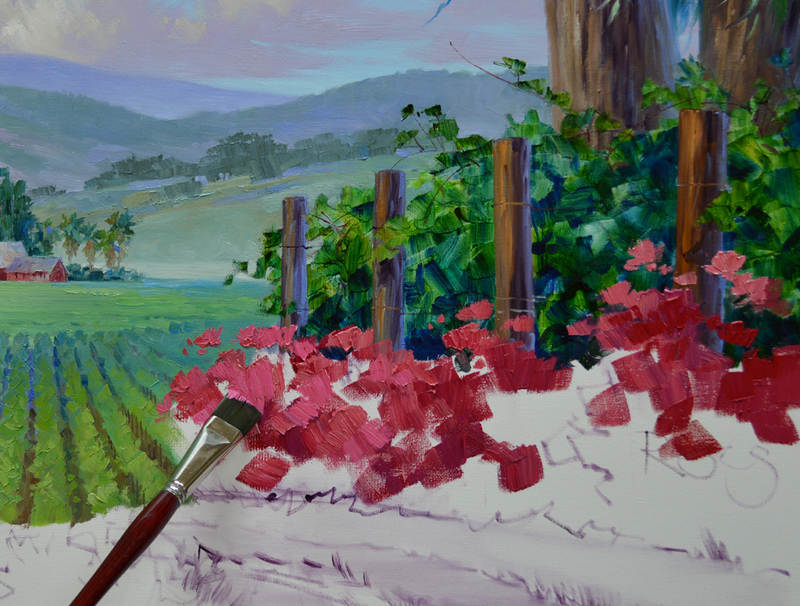 If the greens were painted first my brush would pick up some of the leaf color when blocking in the flowers and muddy them. 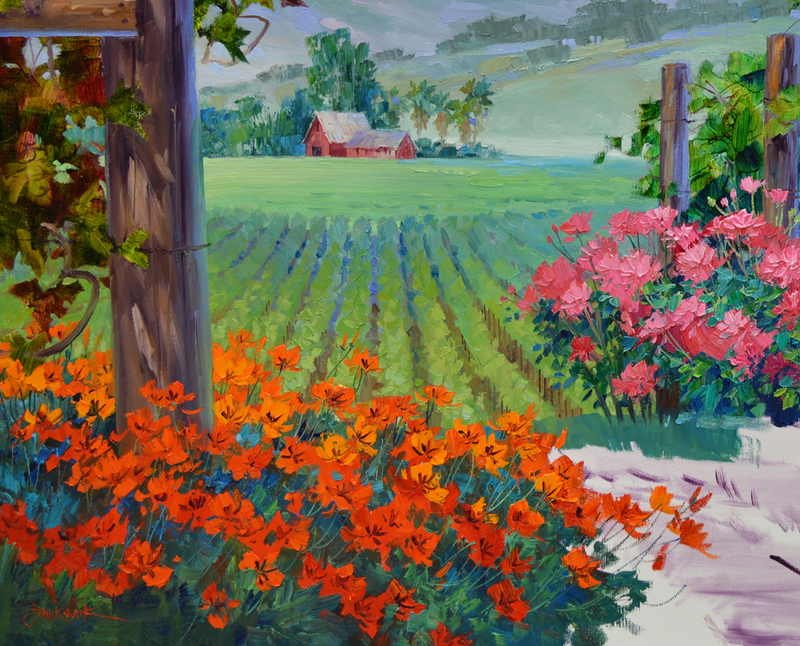 The California Poppies in the foreground are painted in the same order: Flowers First, Leaves Last. 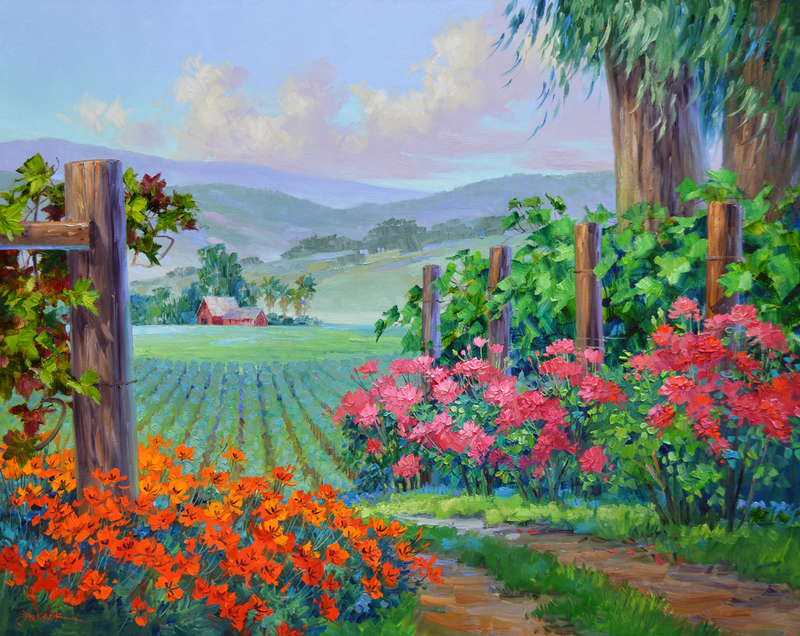 In the picture above I do have to paint some of the orange blossoms over the distant vineyard. 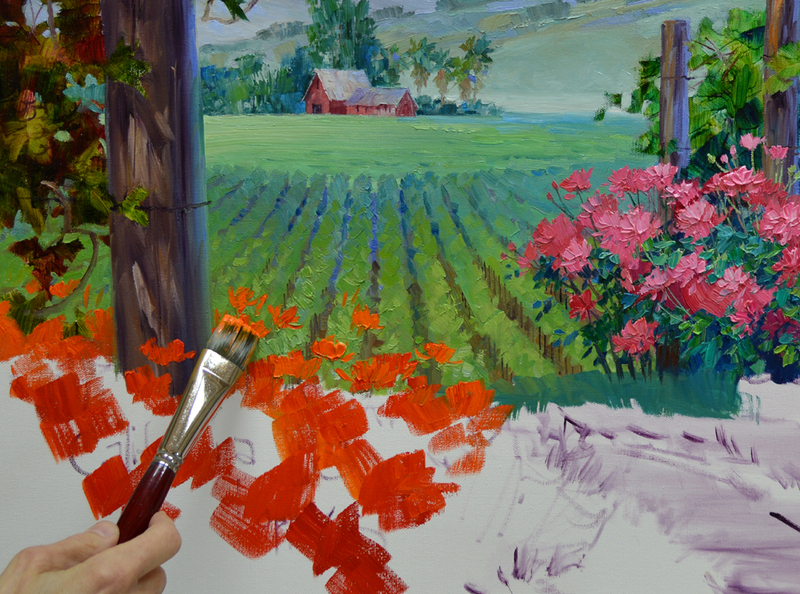 I carefully “Lay” the paint over the green so I don’t pick up any of the underlying color and dirty the flowers. The foliage of the California Poppies is painted and thin stems are added with my fine liner brush. 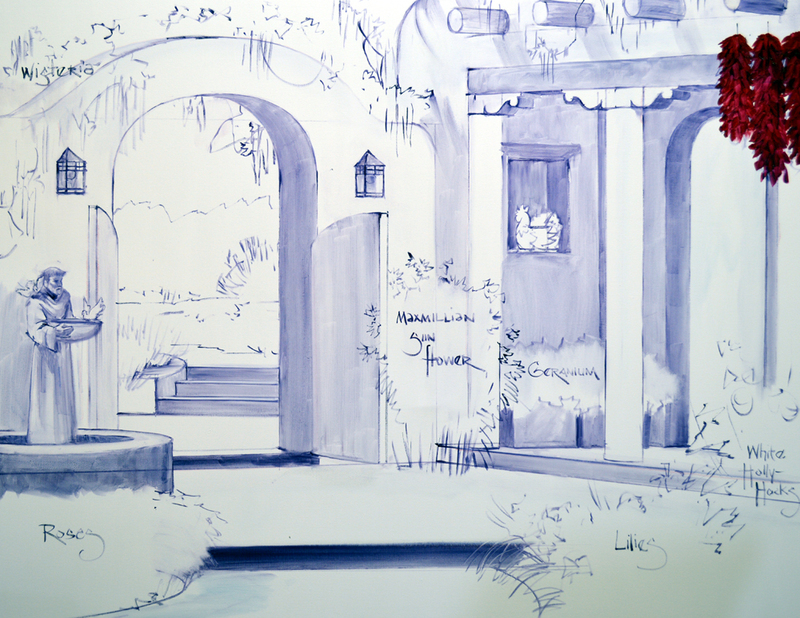 A few brush strokes of Pthalo Blue + White are added into the leaves to give the feeling of depth. I sign the piece in the wet paint of the leaves with Cadmium Red Light. 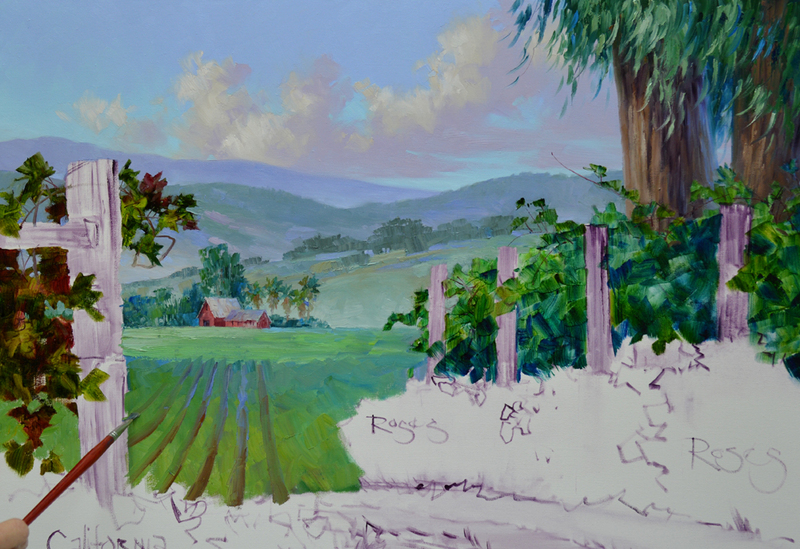 After finishing the foreground I decided the vineyard in the valley was too bright and warm. Look at the previous image, you can see what I’m talking about. I cooled the vines and let a shadow fall across the field. Now they drop back into the valley. Painting forward the closest mountain is made even warmer. 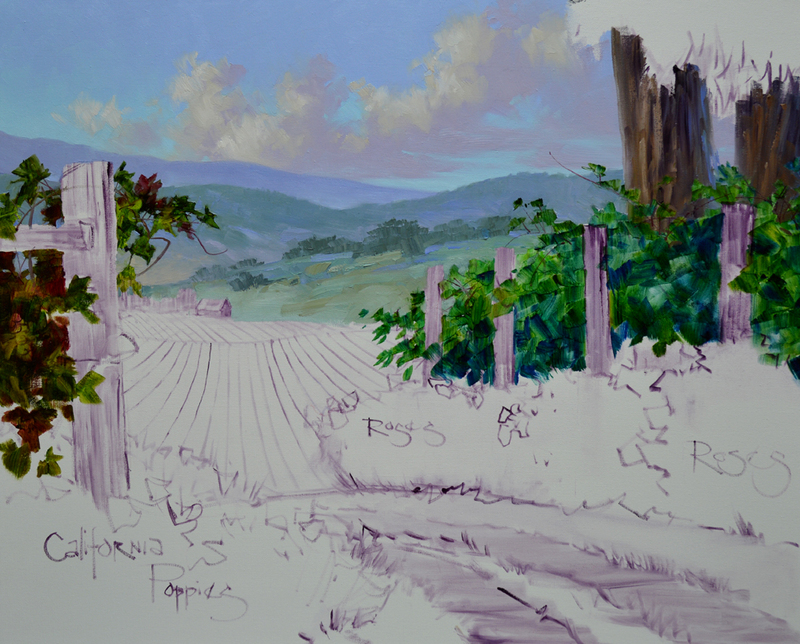 Soft greens are mixed from various combinations of Pthalo Blue + Cadmium Orange + White. Some of the blues from the more distant mountains are also worked into this one. The trunks of the Eucalyptus Trees are now blocked in. Since the sun is pouring into the painting from the left the trees provide a dark upright to stop the light from taking the viewer’s eye out of the painting. 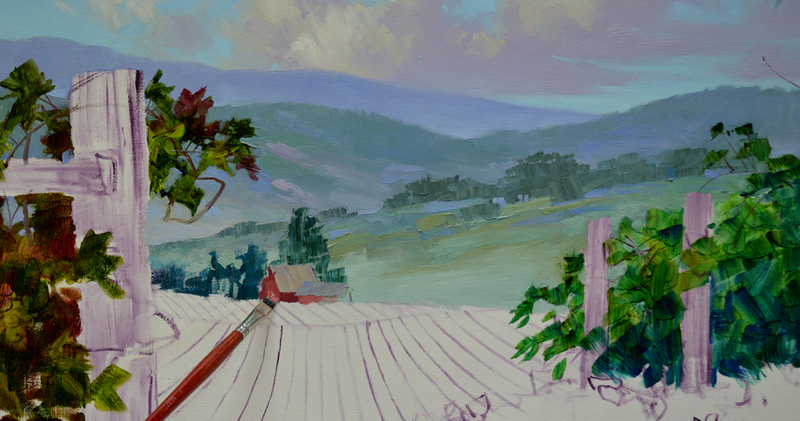 Soft reds made of Alizarin Crimson + White are used for the barn. The trees surrounding the barn are finished. 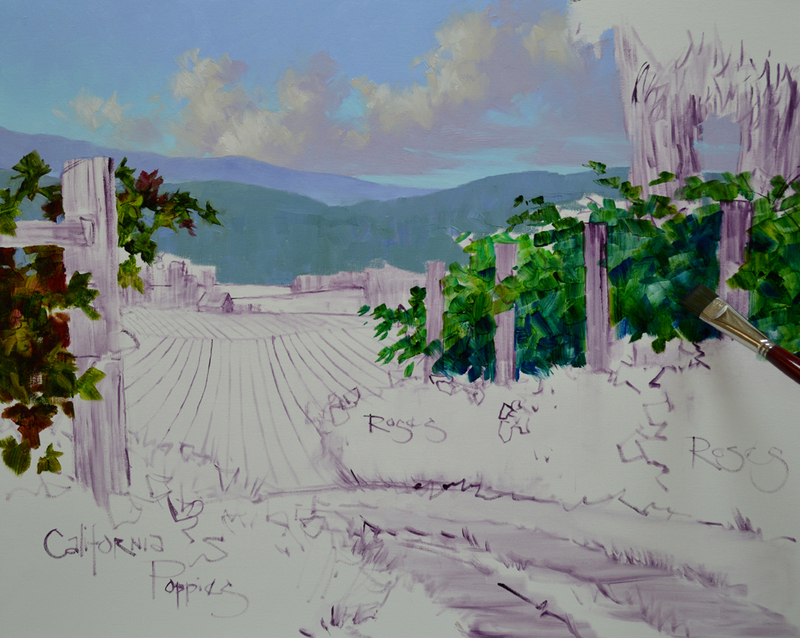 I begin working forward on the vineyards in the valley below. The entire field is painted with cool greens, notice how the distant part is made bluer so it will recede. 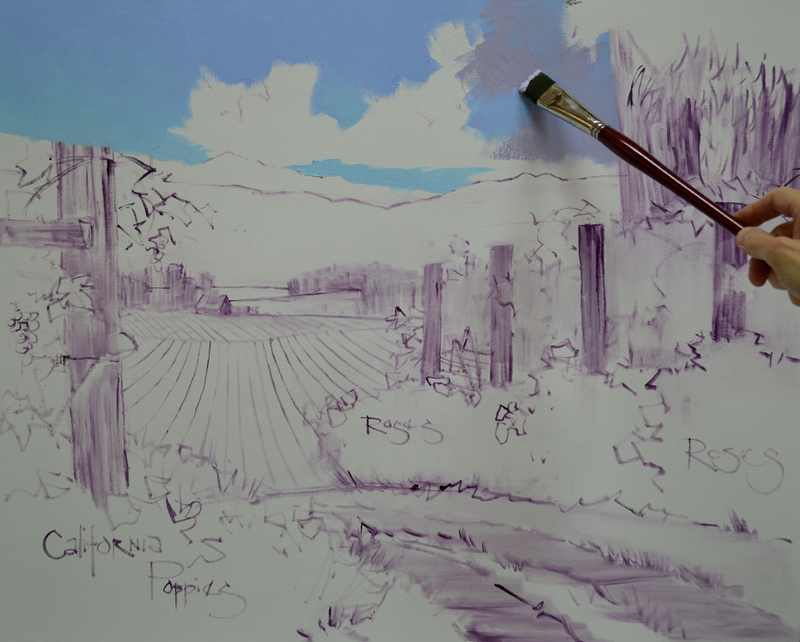 The rows are added into the wet paint of the vines. The brown of the dirt gets bluer at the far end of the rows. Love Wine? Let’s go to Napa. 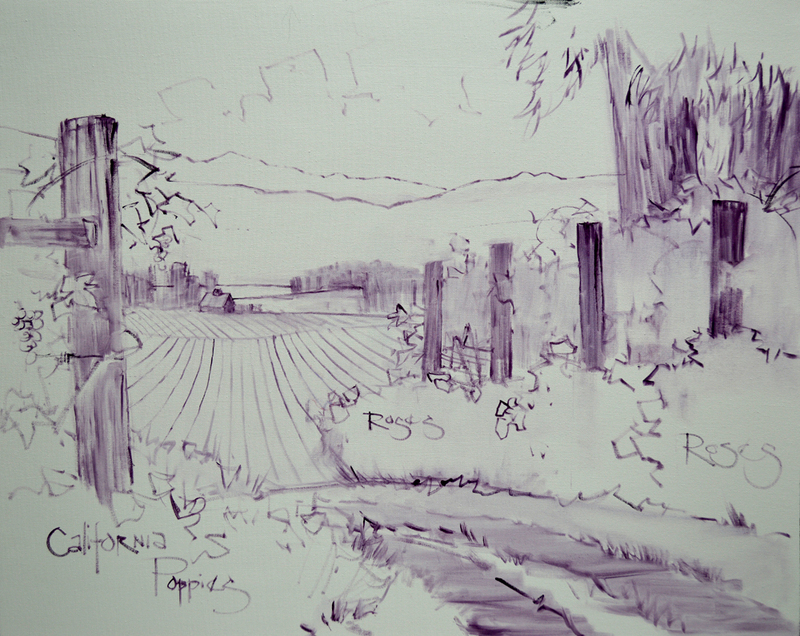 The beautiful California Valley is to be the star of this piece. 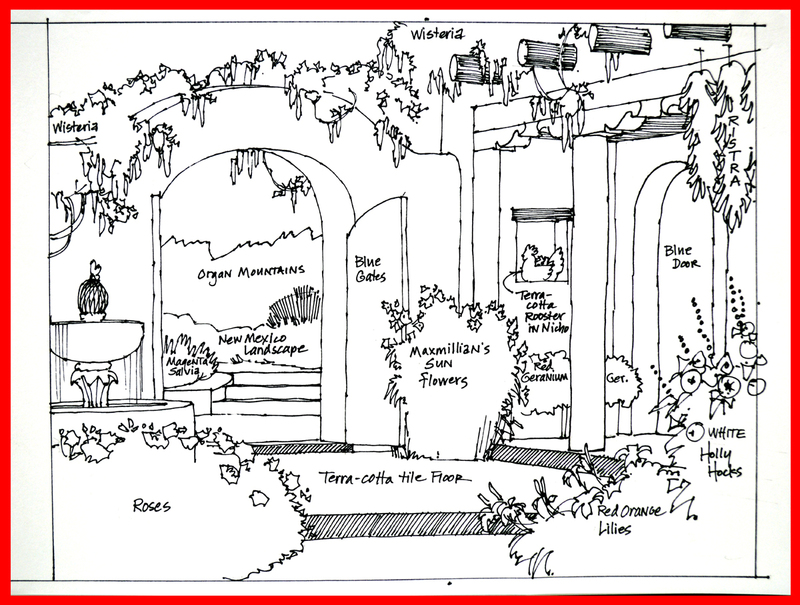 My sketch is shown above. 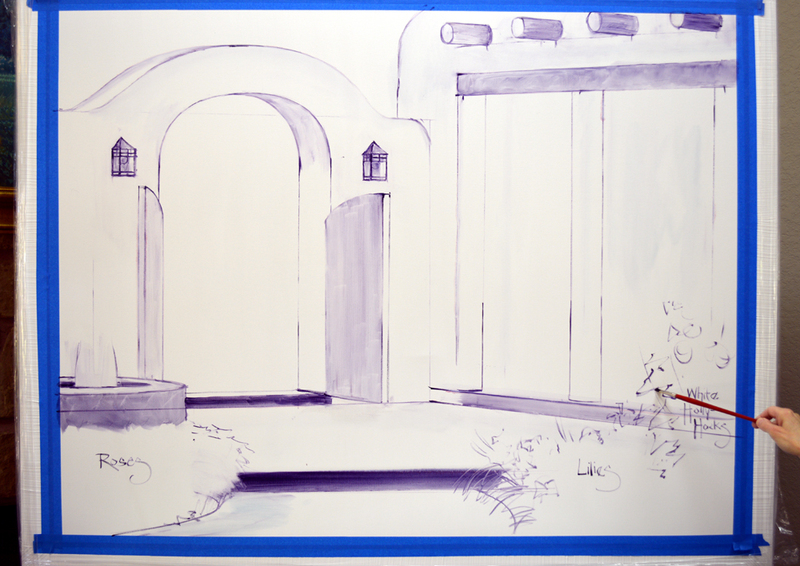 I’ve started drawing up the basic elements with a thin oil wash of MUD (Ultramarine Blue + Alizarin Crimson) + Liquin. 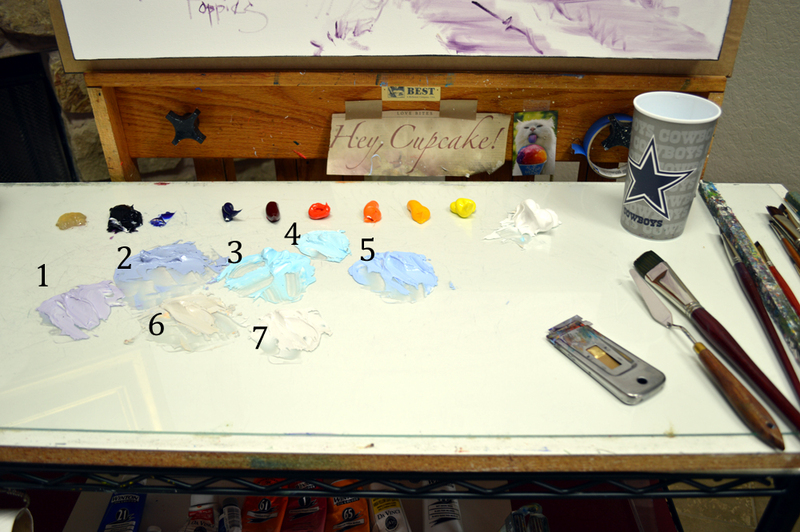 You can see the colors of our Double Primary paint mixing system laid out on the glass palette. 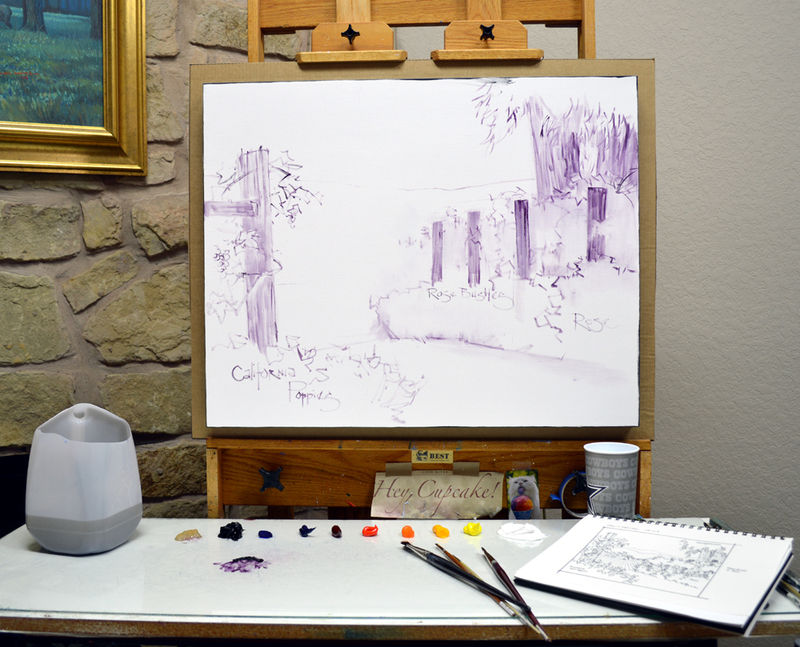 To learn more about how we mix our oil colors CLICK HERE. The design is sketched up and we’re ready to start applying paint. I label the flowers as memory jogger. We’ll begin with the sky, my paint is mixed and ready to go. #1. MUD + White. #2. MUD + Ultramarine Blue + White. #3. Pthalo Blue + White. #4. Mixture #3 with more White Added. #5. Cobalt Blue + White. #6. Ultramarine Blue + Cadmium Orange + White. #7. Mix #6 with additional White. You may click on the picture to enlarge the image. The blue sky is blocked in first. 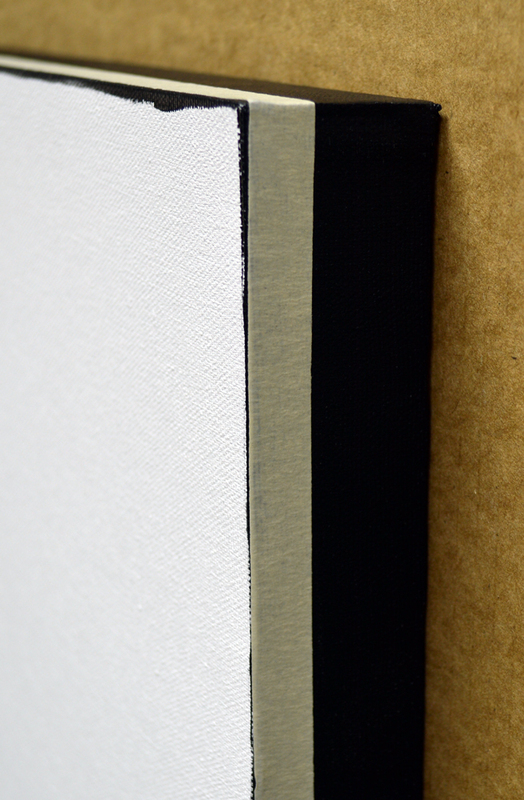 Mix #5 is used toward the top of the canvas, #4 closest to the horizon and #3 in between. The transition between the different colors is made smooth. Since the clouds are in large masses I leave that area uncovered. The clouds are started with the shadows (mix #1) first. The Middletones (#6) are painted next, followed by the Highlights (#7) at the very last. The most distant mountains are made with mixture #2. The foreground mountain is painted warmer so it will come forward of the bluer or cooler one behind it. 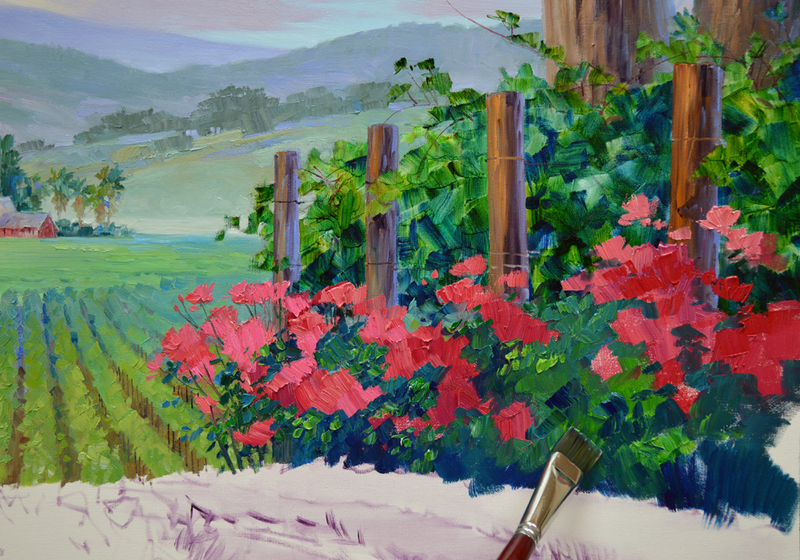 The vine on the left is now washed in with Sap Green + Liquin and Alizarin Crimson + Liquin. This is one of the times I add a special color to my usual Double Primary Palette. The wash of Sap Green juxtaposed with the Alizarin wash gives the feel of the large leaves backlit by the sun. 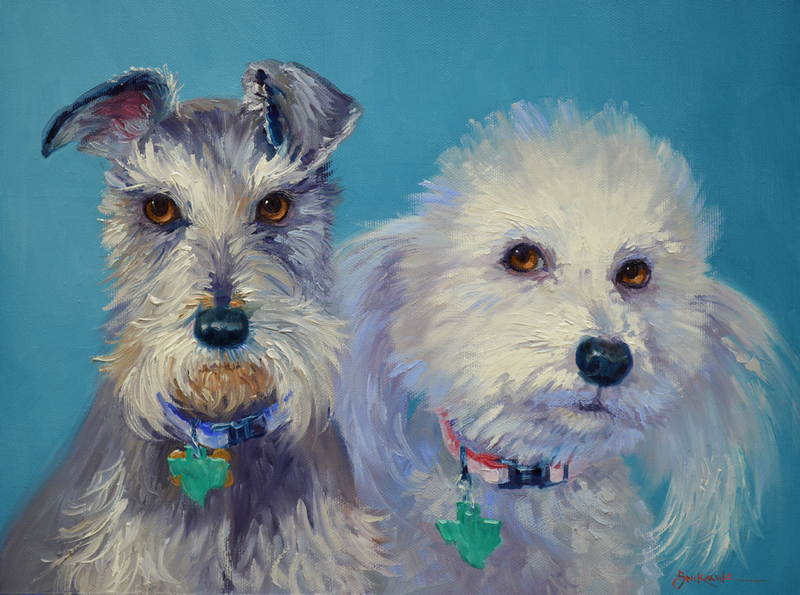 This painting is going to California and will be framed in a special “float” frame developed by Paul and Kathy at Gallery 1870. Like all of my paintings a white square is painted on the back of the canvas with KILZ paint, purchased at Home Depot. This keeps the Sharpie labeling from bleeding through. 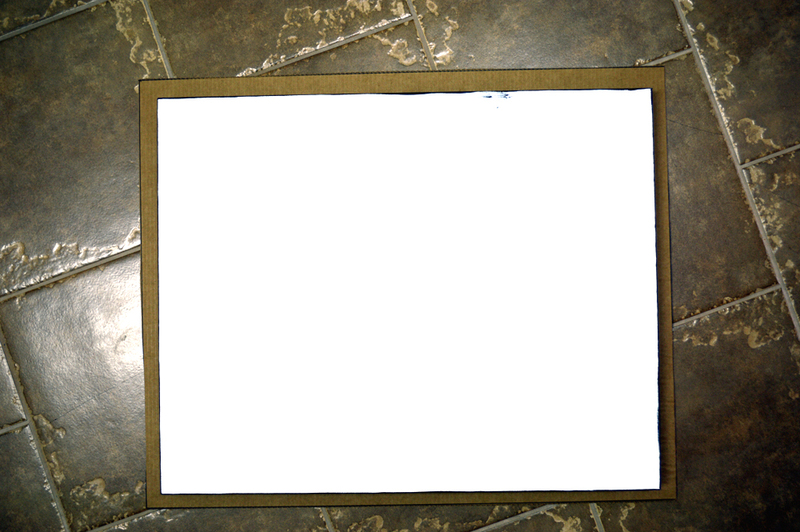 The Title, Number Code of Authenticity and my Signature are all written on the white square. This piece is to be painted to the edge on a gallery wrap canvas. 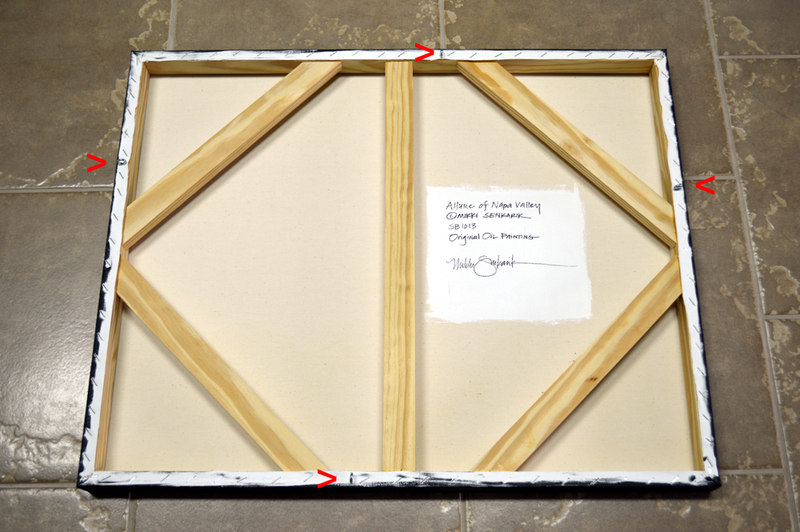 In order to handle and ship the piece safely I do a little extra canvas preparation. First screw eyes are placed in the stretcher bars on each side at the red arrows. 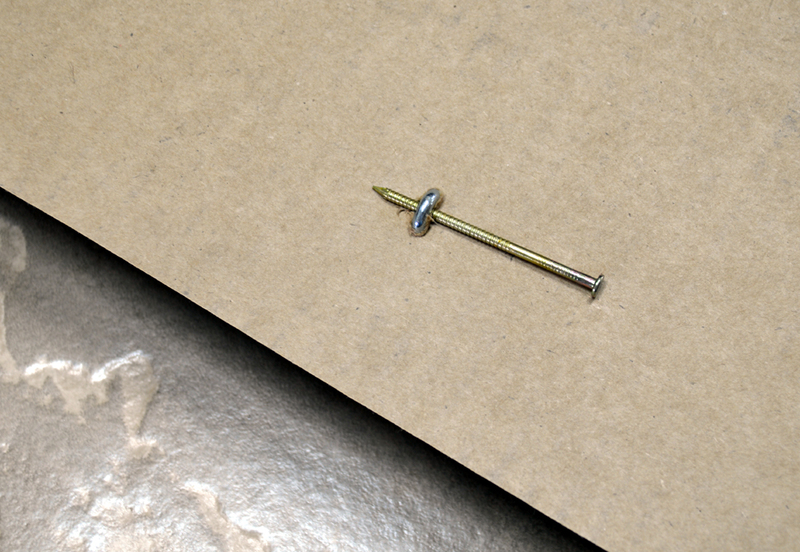 Here is a close up of one of the screw eyes inserted in the stretcher bar. To see any of the pictures larger just click on the image. 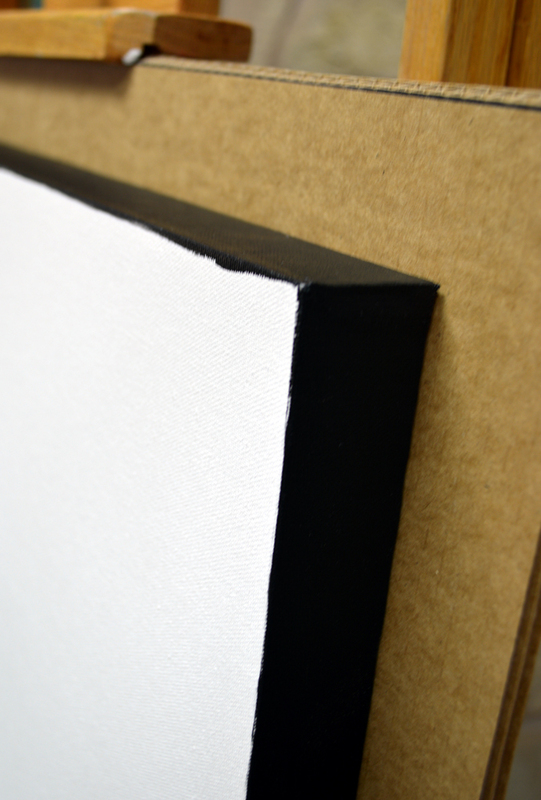 Then the canvas is placed on a piece of double ply cardboard a couple of inches larger than the canvas and lightly pressed down. 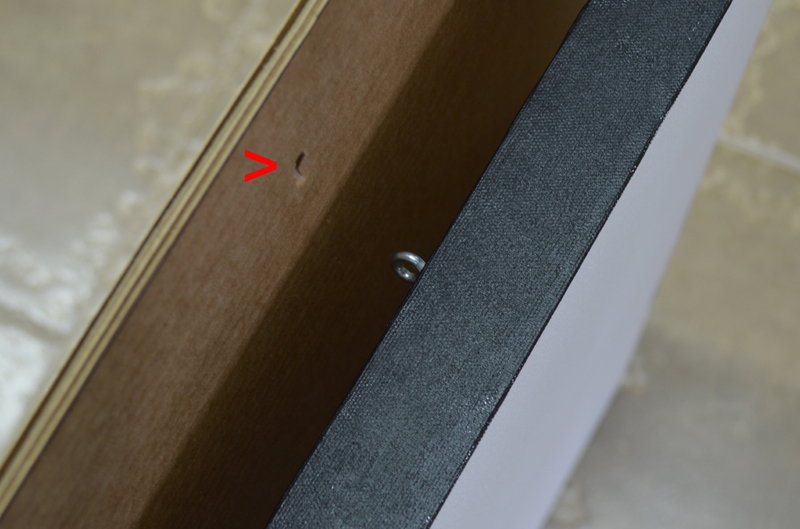 The screw eyes make an indentation in the cardboard. A hole is made at each indentation with an ice pick. 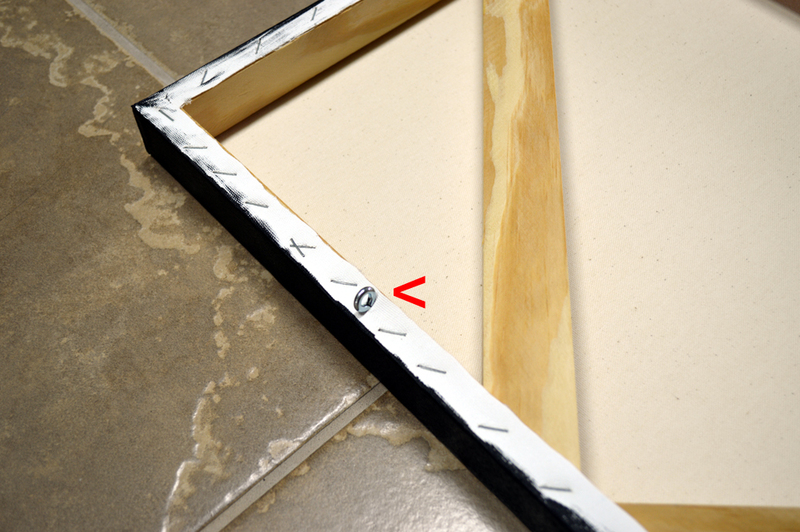 The canvas is placed back on the cardboard, the screw eyes lined up with the holes and pushed all the way through. 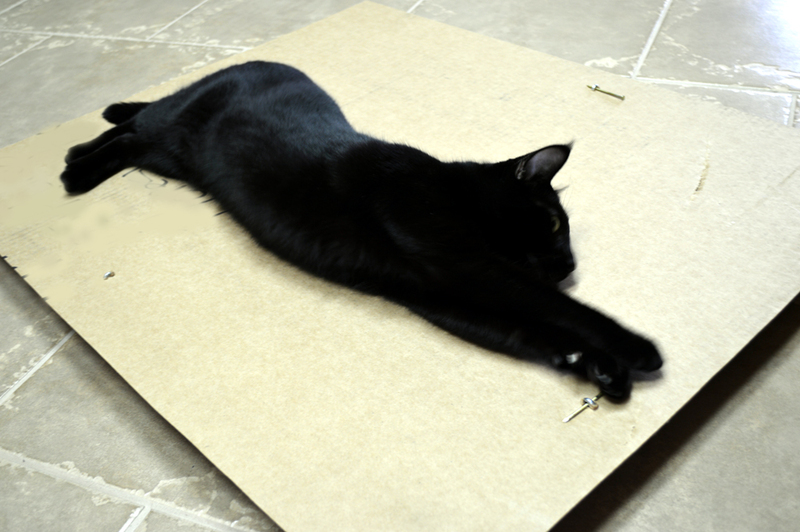 Then a nail is inserted to hold the canvas tight against the cardboard. Molly, our shelter rescue kitty, decided to help insert the nails!